Thank you so much for liking the post!! I love watching seagulls, they seem to enjoy flying just for the fun of it. Thank you for your visit and comment. Its true that the seagulls simply enjoy flying. Thank you very much for your visit and comment. Glad to know that you liked the post. Congratulations on your 200th posts! I will definitely be back to check more of your photos, seeing that sidebar photo peek it clearly looks like you had such amazing travels! Great pics! 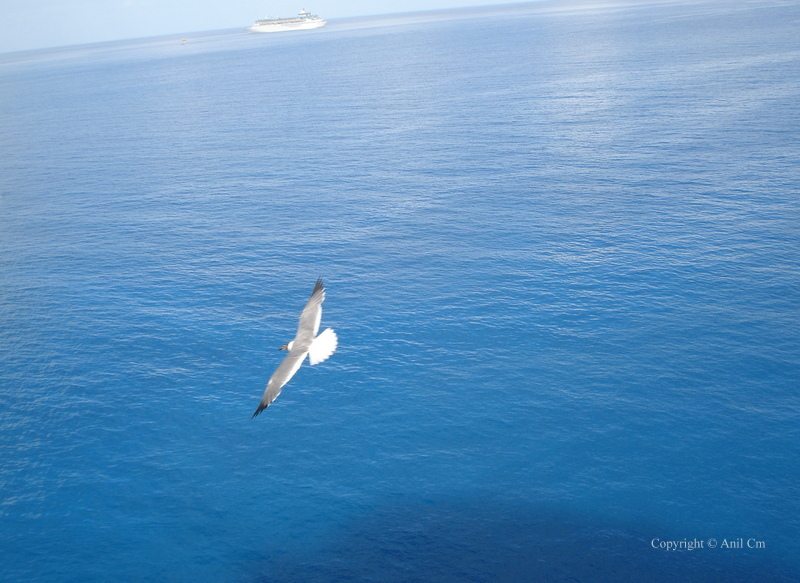 I tried to capture a flying seagull when l was on the top deck of the ship. It didn’t come out so well. The zoom wasn’t working well so it looks like a bird dropping instead 😦 Thx for stopping by! Thank you so much again for liking this post. Thank you very much for your return visit and liking the post. The Book I have not read but its nice to know about it. Thanks. Love the Gull. They always seem to be escaping. However, the cruise ship anymore seems to be a place to escape from. Thank you so much for stopping by and comment. Seems they are very happy and friendly with the cruise ships. During such a moment, it was captured. Thanks again. u r really good at taking photos! awesome! !